SDR receivers (Software Defined Radio) perform all signal processing in software, offering multi-standard support, access to all data in the channel, and advanced RF measurements. DekTec's other receivers are based on standard demodulator chips and therefore do not take cycles from the host CPU. These can be used if the SDR features are not required. SDR receiver with support for ATSC 3.0, ATSC VSB, DAB+, DVB-C(2), DVB-T, DVB-T2, direct I/Q, ISDB-T, QAM-C and T2MI. Advanced RF measurement available for all standards (option). Dual-channel cable receiver for ITU J.83 Annex A, B and C (QAM-A/B/C). Two ASI monitoring outputs. Dual-channel satellite receiver for QPSK, 8-PSK, 16-APSK and 32-APSK. Supports advanced DVB-S2 features and LNB power supply. Two ASI monitoring outputs. 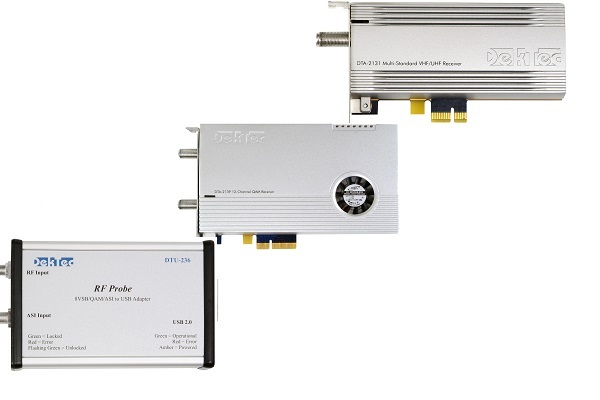 Dual-channel cable/terrestrial receiver for DVB-T2, DVB-T, DVB-C2, DVB-C and ISDB-T. Full support for SPLP and MPLP, SISO and MISO. Portable receiver and analyzer for ATSC 8VSB and QAM-A/B/C, with tuning range from 45 to 1002MHz. The DTU-236A is USB-bus powered, so no power supply is required. Portable receiver and analyzer for terrestrial and cable standards, with tuning range from 45 to 1002MHz and support for DVB-T, DVB-T2, DVB-C(2), and ISDB-T. The DTU-238 is USB-bus powered, so no power supply is required.